As I said, emphatically, in my Kent & Sussex Spring Tea Review, the tea lovers at Kent & Sussex Tea & Coffee Company know their tea. Each loose leaf tea I’ve had from Kent & Sussex has made my top 10 list of all-time favorite teas. The one I’ll review today is no exception – in fact, it’s a strong contender for top 3. The Creme D Orange Green and White Tea is phenomenal. Creme D’Orange is a mixture of Green and White Chinese tea, with vanilla flavoring and orange which make absolute magic together. This beautiful tea reminds me of Orange Creamsicles. The vanilla and orange combination is a throwback to a time I grabbed an Orange Creamsicle each time I passed the refrigerator. If you aren’t familiar with Orange Creamsicles, just know this – the flavor combination is a wonderful, wonderful thing. Creme D Orange Green and White Tea is fantastic on ice but you get a much heavier vanilla flavor when it’s cold. The Vanilla/Orange balance is most noticeable when this tea is served hot, and that’s the way I prefer this one. With the Spring Tea, I love it equally both iced and hot, but with this tea, the hot is just so extraordinary, iced really never stood a chance. This is a perfect loose leaf tea and I whole-heartedly recommend it. You cannot possibly order it soon enough and you cannot possibly order too much of it. 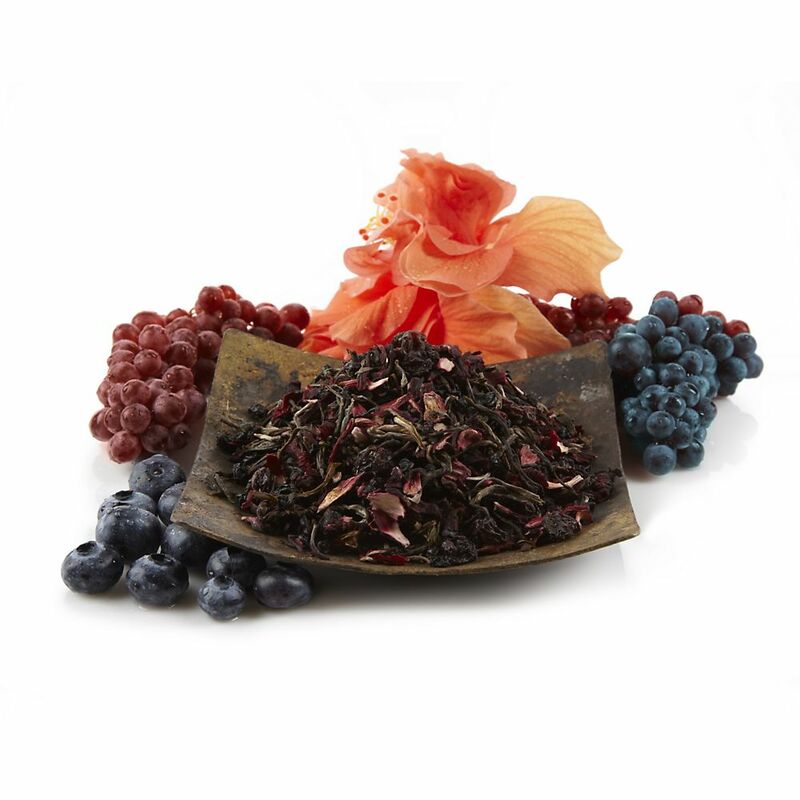 Ingredients– China Sencha Lung Ching, Yunnan Pai Mu Tan, Rose buds, Vanilla Flavoring, Orange slices and Carrot shreds. 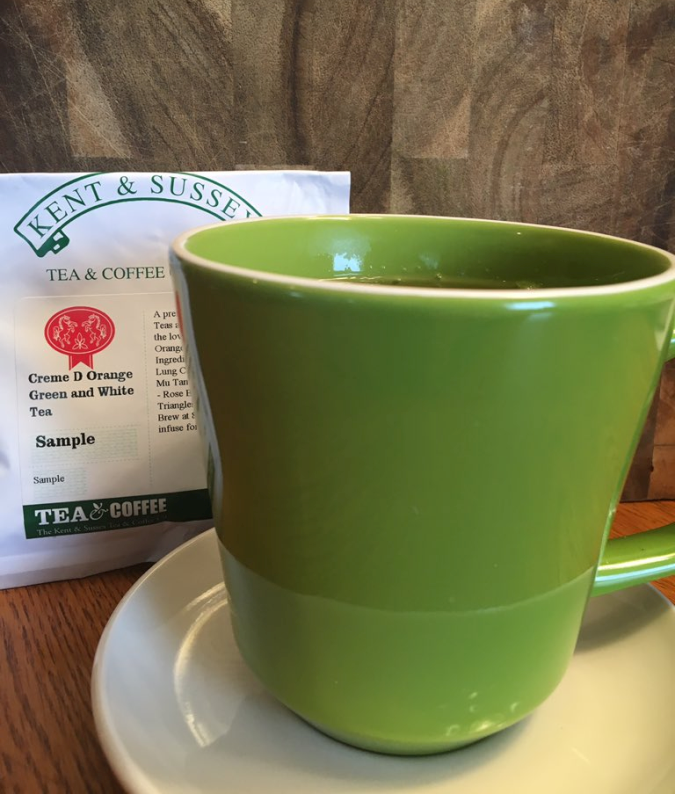 Where to Buy – Find Creme D Orange Green and White Tea on Kent & Sussex Tea & Coffee Company’s website. We all know that tea is magical. A tall glass of iced tea or a piping hot mug of tea can transform even the most ordinary day into an extra special day. Not only is it delicious, it’s healthy. For those who love White Tea , new research suggests that it may be as good for the way you look as it is for the way you feel. According to a recent lab study, extracts in white tea exert an anti-inflammatory effect that slows the breakdown of collagen and elastin fibers — those super-supportive intracellular structures that skin needs to stay firm and wrinkle-free. 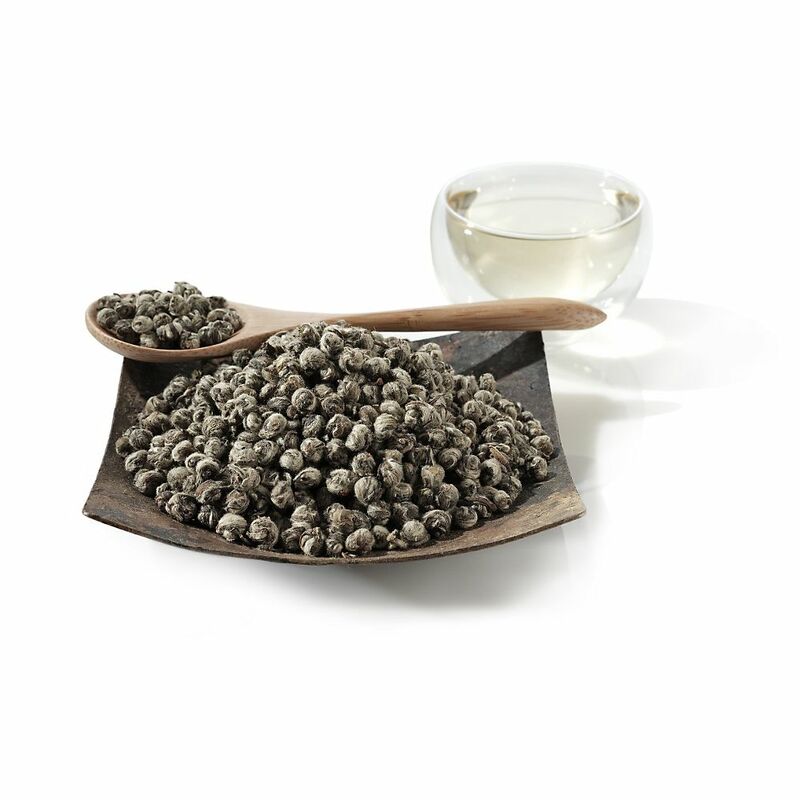 While more studies are required, White Tea is believed to be a valuable weapon in the war against aging. 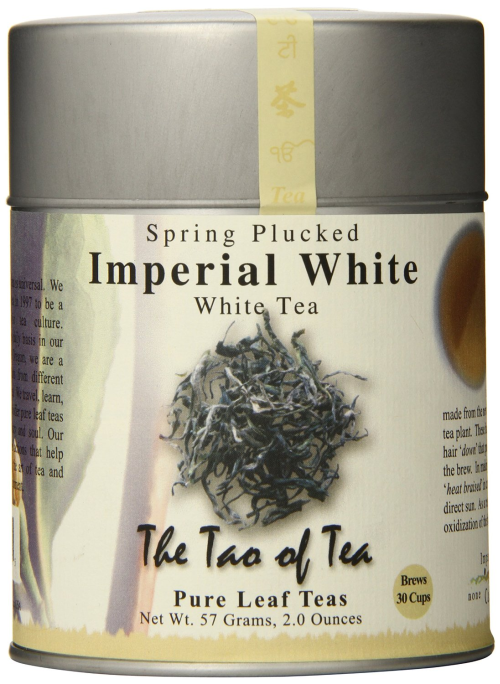 What’s more, White tea may have special fat-fighting powers! While they’re still coming up with all the proof they need in the labs, common sense says that – in addition to avoiding sun during the middle hours of the day, using sunscreen, eating healthy, and not smoking – drinking more tea isn’t just a healthy idea.. it’s a beautiful one. I’m so crazy about Lipton’s Pyramid Tea Bags. I love that the tea leaves have room to spread in the bag to release their flavor; I love that I can see exactly what the leaves look like; I love that the box always smells amazing when I open it. So yeah, big fan here. 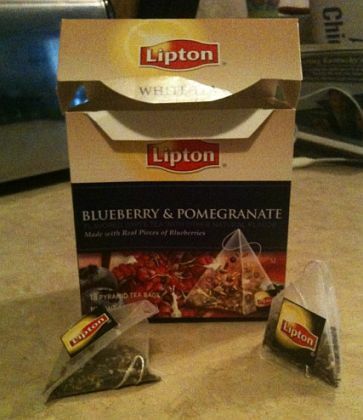 Lipton’s Blueberry & Pomegranate White Tea is quite a treat. As someone who has never eaten pomegranate by itself, per se, I can’t really drink this and say, “Oooh, this tastes just like the last pomegranate I ate!” However, I love blueberries and I can definitely identify that taste in this tea. The tea bags actually contain real pieces of blueberries, which ends up making this tea taste and smell like some sort of decadent dessert or treat as opposed to just white tea. The tea’s ingredients list dried apples, which I had identified by smell before reading the list. 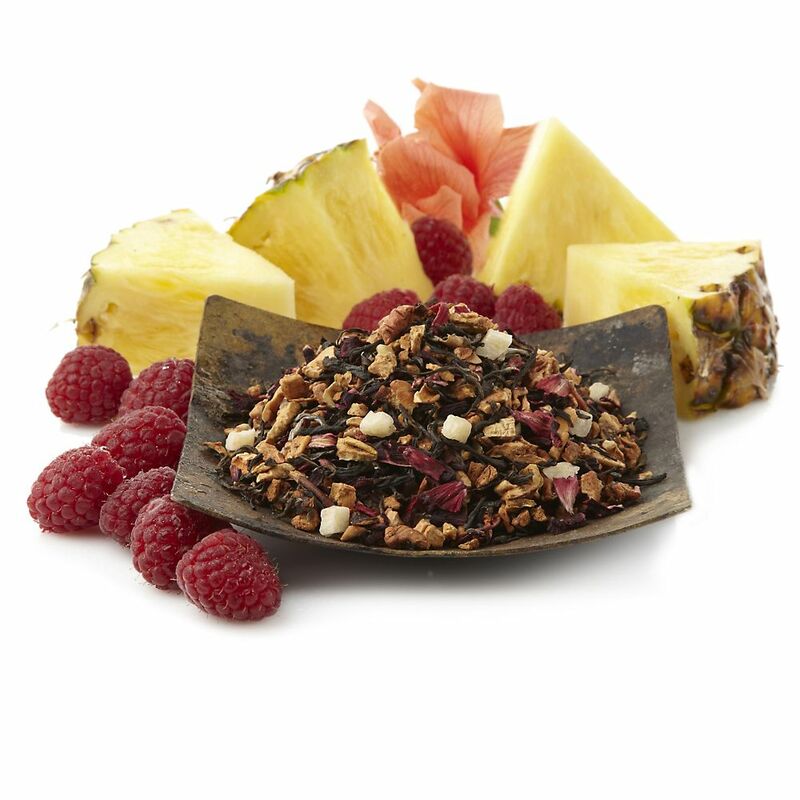 It also contains blackberry and raspberry fruit pieces, green tea, cinnamon bark, and orange peel, among other natural things. Seriously, though, sounds like an ingredient list for a pastry or yummy treat. 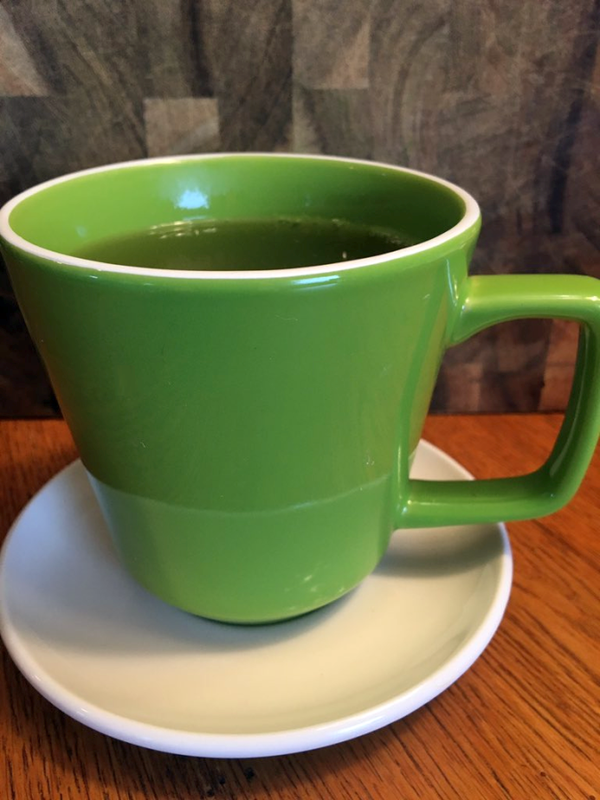 This tea packs 65mg per serving of body-protecting flavonoid antioxidants, 20mg of potassium, and 25mg of caffeine per serving. Just pour boiling water over a tea bag and let steep for around 2-4 minutes (your preference), and enjoy! Confession: I’m a sucker for any product that has “island” in the title. I pretty much live for my annual beach vacation, and those marketing people know where to hit suckers like me. But this tea could be called “XYZ Tea” and it would still be one of the best teas I’ve ever had. 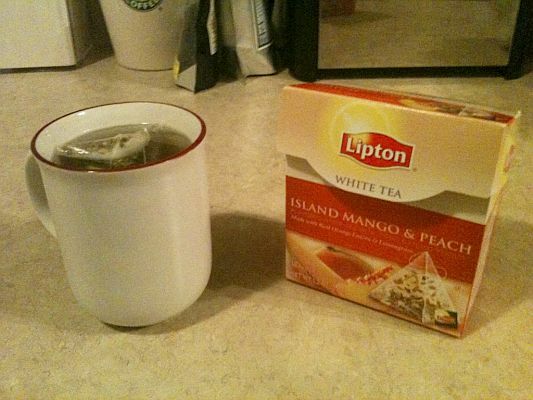 Seriously, Lipton’s Island Mango and Peach tea is good. 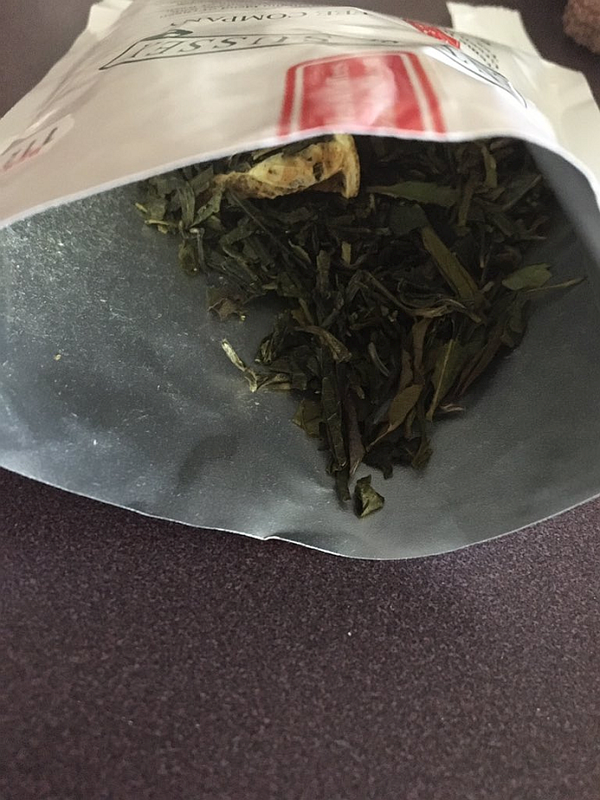 For starters, the tea comes in pyramid-shaped bags, which allows the leaves a lot more room to spread, allowing for a smooth, rich flavor to flow into the cup. 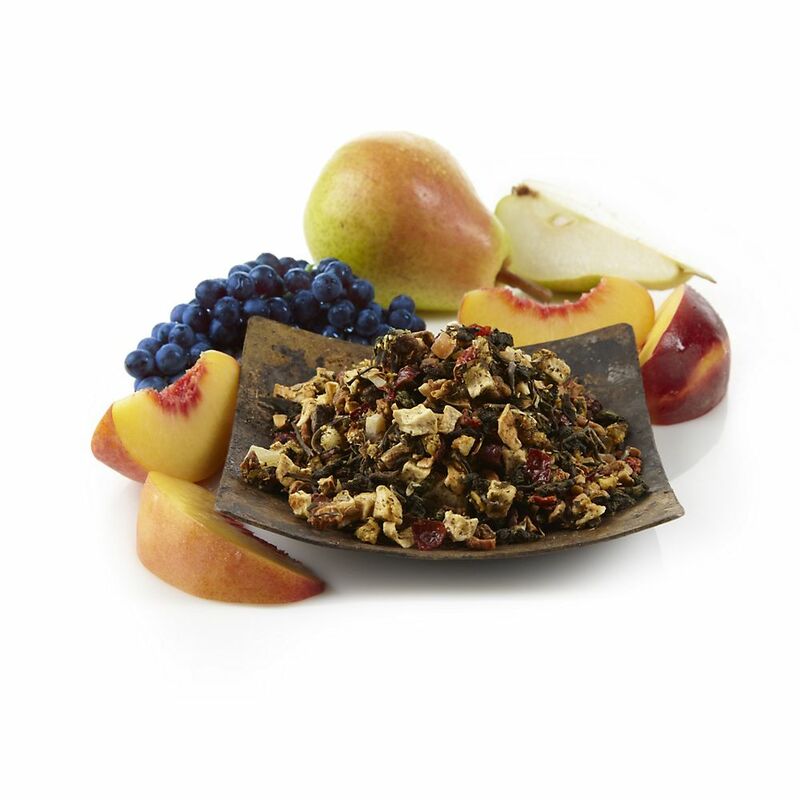 The leaves are infused with actual pieces of fruit, which gives the tea a REAL fruit taste – something authentic – as opposed to the flat flavor found in a lot of “fruity teas”. The box comes with 18 of these bags, and each bag packs 75mg of flavonoids per oz. serving. Ahhh, the healthy deliciousness of this tea. 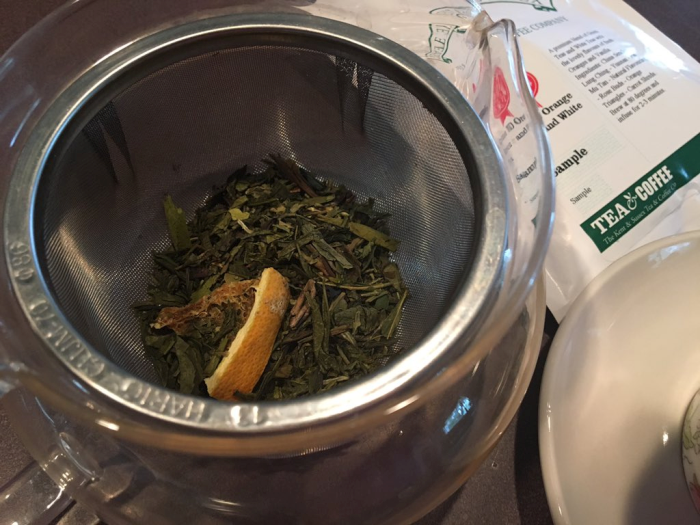 This is technically a white tea, although the ingredients also lists green tea, along with rose hips, lemon grass, orange leaves, and a few other natural ingredients. I always drink this tea hot – the scent is pretty killer – but it also makes a great iced tea. This is one of my favorite teas and one that I always make sure is in my cabinet. I recommend it for anyone that loves white tea, green tea, fruit tea, herbal tea, orange or peach tea, healthy and nutritious drinks…or has a pulse. That means you, buddy.